My transformation may not be one you can see as much as some others. My transformation comes from within and it is one of confidence. I have struggled with feeling insecure my entire life. 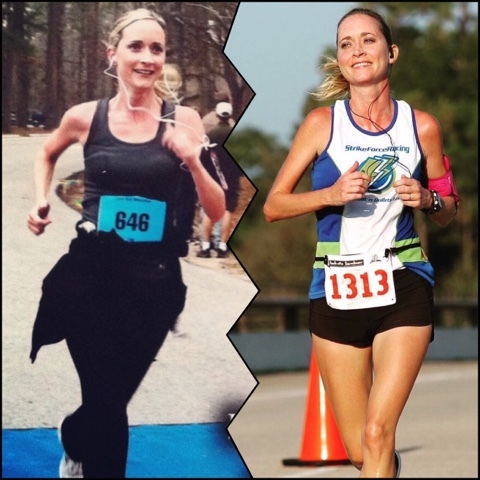 This is a picture of my very first race ever in 2013 (10k - pace 11:00) and a picture of my most recent race (10 miler - pace 8:04). From the beginning of this journey at 37 years old to today at 40 years old I have never felt better and more confident in my life! That first race changed my life! How did your first race change you? You're journey was just beginning and is still evolving!!! My first race was way back in high school with my Dad. I don't think it really changed me but it definitely gave me confidence about distance (back then a 5k was distance to me) when I didn't really have it. It was shortly after that, that I began running further and further because I realized just because I wasn't always a distance runner didn't mean I couldn't become one. We come in all shapes, sizes, and ages!